Here's an update on a new article I published last Thursday on Triple Pundit with the latest news from the guitar world with regards to wood use. 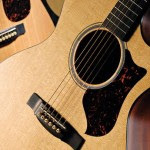 The article reports on a new Martin guitar made in part of FSC-certified recycled Sitka spruce that comes from dismantled Canadian bridges where it had been used in construction and follows up on the August raid in Gibson Guitar plants, following a suspicion that a shipment of sawn ebony logs from India that was imported by Gibson illegally, violating the Lacey Act. If you heard the words “guitar” and “environment” in the same sentence in the last few months you were probably hearing about the raid on Gibson Guitar. While the August raid on Gibson’s factories continues to draw a lot of attention and still gets conservatives and Tea Party supporters angry, another guitar company is coming up this week with an innovative effort to connect the dots between guitars and the environment in a positive way.